MADISON, Wis. -- The story of Wisconsin woman who helped lead the Nazi resistance in Germany is coming to light after the opening of KGB and CIA files. For nine years, Mildred Fish-Harnack and her husband Arvid led Berlin's underground resistance to Adolf Hitler. After their capture, Arvid was sentenced to death and Mildred to six years in prison. The trials were considered state secrets and often family members weren't told. The defense argued that Mildred Fish-Harnack simply acted on the orders of her husband. German judges were impressed; Mildred held a prestigious job at Berlin University and pioneered the study of American literature. They felt that she served the cause by translating great German works into English. On Dec. 21, 1942, Hitler signed Arvid's death sentence. The next day, Arvid and members of the Red Orchestra were paraded into a building on the grounds of Plotzensee Prison, a sprawling 60-acre complex with 20-foot high security walls and newly installed meat hooks hanging overhead. Each of the accused were hung with a short rope, a Nazi torture tactic to prolong the agony of their victims. But when it came to Mildred Harnack's six-year prison sentence, German experts said that Hitler refused to sign her sentence, calling her a meddling American. "Hitler and Goering were very angry," said Johannes Tuchel, director of the German Memorial Resistance Center. A retrial was extremely embarrassing to the prosecutor Manfred Roeder, also known as "Hitler's Bloodhound." The Harnack family courageously tried to intervene. Tuchel said Roeder refused their questions and screamed, "I urgently warn the Harnack family not to undertake anything whatsoever in favor of this woman. She no longer belongs to your family." "The two women got another trial in January 1943, and they were sentenced to death on direct orders of Hitler," Tuchel said. According to the German Resistance Memorial Center, no record of her second trial has ever been recovered. "We have the orders from Hitler that there has to be a second trial. But, unfortunately, of the second trial we have no direct information," Tuchel said. On Jan. 16, 1942, Mildred was sentenced to death and transferred to Plotzensee Prison. On her final day in prison, Mildred gave up a book titled "The History of the Ancient World" by Michael Rostovzeff, a former University of Wisconsin professor. She gave it to her prison guard and wrote inside, "To Miss Klang in memory of Feb. 16, 1943. In the room where you can see the beautiful trees through the window." One of the last people to see her alive, Pastor Harald Poelchau, said he remembers how at age 40, Mildred was so starved and broken after five months of Nazi interrogations that she could no longer stand upright. In their last meeting, he smuggled in a picture of Mildred's mother. Mildred spent her final days finishing the work she first discovered at the University of Wisconsin. "Mildred Harnack had a volume of Goethe poems with her when she was arrested, and during her time of incarceration, she translated some poems," said Andreas Sander, curator of Topography of Terror in Berlin. Poelchau secretly carried a book out of Mildred's prison cell. Inside were her translation notes for the Goethe poem "Vermachtnis the Legacy." The translations would become Mildred's legacy. "She was an academic of the first rank. Had she lived longer, she would have contributed much more," said Art Heitzer, a Mildred Fish-Harnack expert in Milwaukee. But instead Mildred Fish-Harnack's hair was cut to expose her neck. With her hands cuffed behind her back, two guards led her into a courtyard where the Nazi tools of death were housed. It was the same place her husband had been hanged 57 days earlier. Inside the red brick building, she faced the Bradenburg guillotine. On Feb. 16, 1943, Mildred Fish-Harnack was executed at 6:57 p.m. The Nazis noted that it only took her seven seconds to die. She was the only American woman in history to be executed on direct orders from Hitler. Her last words were: "Ich habe Deutschland auch so geliebt," or "I have loved Germany so much." Behind a little red chapel in a quiet cemetery in the Zehlendorf neighborhood of Berlin is the Harnacks' headstone. The Nazis prohibited public executions of the Red Orchestra, and the deaths went unpublished to prevent the enemy from knowing their fate. "There were mixed reports whether Mildred was alive or dead for a period of time," Hetizer said. It was only by luck that Mildred was buried there. After execution, her headless body was put in a wooden crate and sent to an anatomical institute for dissection. But, as it turned out, a professor that Mildred knew recognized her remains and secretly cremated her. He kept her ashes in an urn and, after the war, returned them to the Harnack family. On the night before their trial, Arvid already knew his fate. He wrote a farewell letter to Mildred, and his thoughts were on Wisconsin. "Do you remember picnic point, when we became engaged? Before that our first serious conversation in the restaurant on State Street? That conversation became my guiding star, and has remained so. You are in my heart. You shall be in there forever. My greatest wish is for you to be happy when you think of me. I am when I think of you," he wrote. It's not known if Mildred was ever permitted to read that letter. Arvid Harnack's brother claims that Mildred was forced to watch her husband's execution. Arvid's body is not buried at Zehlendorf Cemetery. The Nazi's took his ashes and threw them in the rivers around Berlin with the saying, "No myths; no remembrance; no martyrs." Mildred and Arvid weren't the only UW students involved in the Red Orchestra. Greta Lork Kuckhoff was a UW grad student from Germany when she met the Harnack's in Madison in the 1920s. "So the UW played kind of a unique role. I don't think there is any other university in the United States that they can claim to have several members of the German resistance, who met and studied on their campus, which is true in Wisconsin," Heitzer said. Greta was actually hired to translate into English "Mein Kampf," Hitler's autobiography and political ideology. She used it as a cover for her underground resistance work. Her husband was executed and she was sent to prison. Soviet troops freed Greta Kuckhoff in 1945, and she became a banking executive in East Germany. Greta fought to bring Mildred and Arvid's prosecutor to justice for "crimes against humanity" because Roeder used torture to get information. She was unsuccessful and he died a free man. Experts said that women played key roles in the Red Orchestra group. The Red Orchestra trials resulted in 19 death sentences for women, including Mildred Fish-Harnack. The women had the most dangerous jobs of organizing meetings and transporting secret documents. No German court has ever reopened the case to see if what happened constituted murder. In Eastern Europe, Mildred Fish-Harnack is enshrined as a hero, but in her home state of Wisconsin she is nearly forgotten. 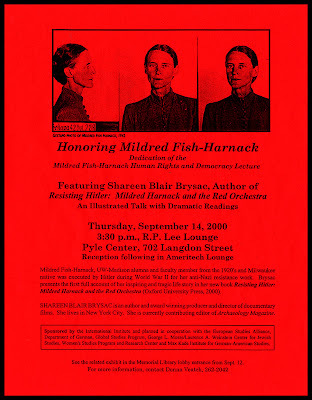 After the war, both sides used Mildred Fish-Harnack's name for political gain and to perpetuate the Cold War. NOTE: WISC-TV and Channel 3000's special series "Mildred Fish Harnack: Back To Berlin" continues Thursday night on "News 3 at 10: The Update." Thursday's segment will examine where the lines between reality and fiction begin to blur in Mildred Fish-Harnack's story.